Power control must be related to its effect on altitude and airspeed, since any change in power setting results in a change in the airspeed or the altitude of the airplane. At any given airspeed, the power setting determines whether the airplane is in level flight, in a climb, or in a descent. If the power is increased in straight-and-level flight and the airspeed held constant, the airplane climbs. If power is decreased while the airspeed is held constant, the airplane descends. On the other hand, if altitude is held constant, the power applied determines the airspeed. Figure 7-20. Airspeed low and altitude high—lower pitch. Figure 7-21. Airspeed and altitude high—lower pitch and reduce power. For changes in airspeed in straight-and-level flight, pitch, bank, and power must be coordinated in order to maintain constant altitude and heading. When power is changed to vary airspeed in straight-and-level flight, a single-engine, propeller-driven airplane tends to change attitude around all axes of movement. Therefore, to maintain constant altitude and heading, apply various control pressures in proportion to the change in power. 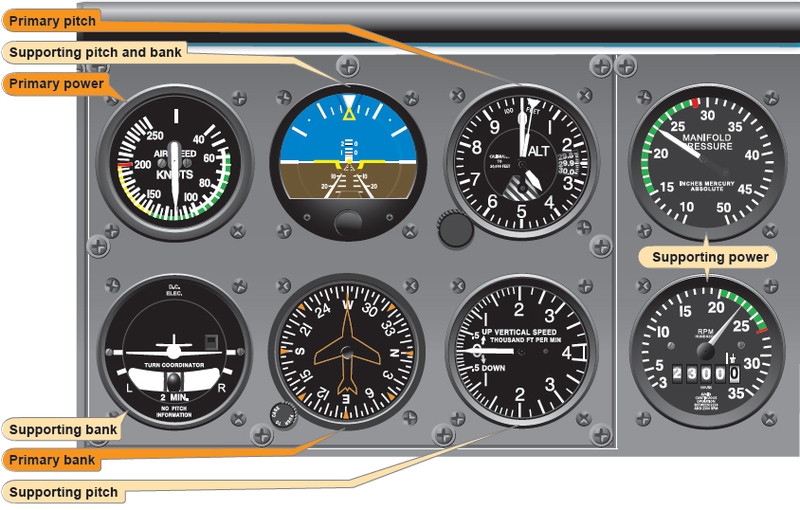 When power is added to increase airspeed, the pitch instruments indicate a climb unless forward elevator control pressure is applied as the airspeed changes. With an increase in power, the airplane tends to yaw and roll to the left unless counteracting aileron and rudder pressures are applied. Keeping ahead of these changes requires increasing cross-check speed, which varies with the type of airplane and its torque characteristics, the extent of power, and speed change involved. Consider the example of an airplane that requires 23 inches of mercury (“Hg) of manifold pressure to maintain a normal cruising airspeed of 120 knots, and 18 “Hg of manifold pressure to maintain an airspeed of 100 knots. The reduction in airspeed from 120 knots to 100 knots while maintaining straight-and-level flight is discussed below and illustrated in Figures 7-22, 7-23, and 7-24. Supporting pitch-and-bank instruments are shown in Figure 7-23. Note that the supporting power instrument is the manifold pressure gauge (or tachometer if the propeller is fixed pitch). However, when a smooth power reduction to approximately 15 “Hg (underpower) is made, the manifold pressure gauge becomes the primary power instrument. 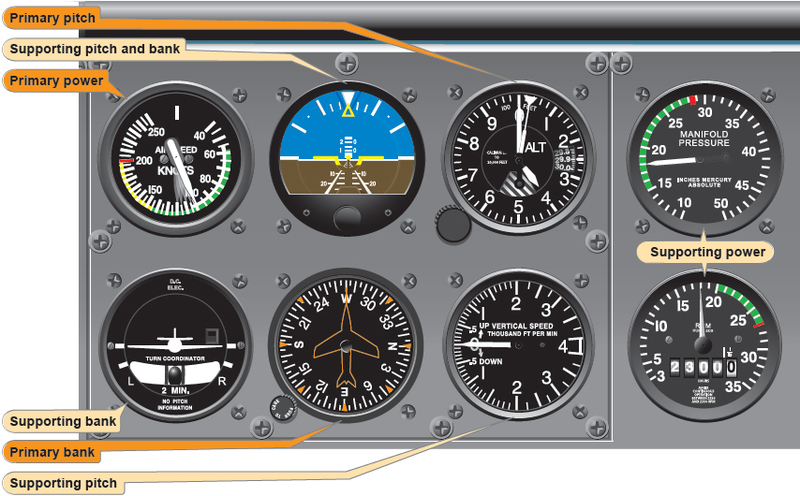 [Figure 7-23] With practice, power setting can be changed with only a brief glance at the power instrument, by sensing the movement of the throttle, the change in sound, and the changes in the feel of control pressures. As thrust decreases, increase the speed of the cross-check and be ready to apply left rudder, back-elevator, and aileron control pressure the instant the pitch-and-bank instruments show a deviation from altitude and heading. As proficiency is obtained, a pilot learns to cross-check, interpret, and control the changes with no deviation of heading and altitude. Assuming smooth air and ideal control technique as airspeed decreases, a proportionate increase in airplane pitch attitude is required to maintain altitude. Similarly, effective torque control means counteracting yaw with rudder pressure. Practice of airspeed changes in straight-and-level flight provides an excellent means of developing increased proficiency in all three basic instrument skills and brings out some common errors to be expected during training in straight-and-level flight. Having learned to control the airplane in a clean configuration (minimum drag conditions), increase proficiency in crosscheck and control by practicing speed changes while extending or retracting the flaps and landing gear. While practicing, be sure to comply with the airspeed limitations specified in the POH/AFM for gear and flap operation. Control technique varies according to the lift and drag characteristics of each airplane. Accordingly, knowledge of the power settings and trim changes associated with different combinations of airspeed, gear, and flap configurations reduces instrument cross-check and interpretation problems. Lower the gear at 115 knots. The nose may tend to pitch down and the rate of deceleration increases. Increase pitch attitude to maintain constant altitude, and trim off some of the back-elevator pressures. If full flaps are lowered at 105 knots, cross-check, interpretation, and control must be very rapid. A simpler technique is to stabilize attitude with gear down before lowering the flaps. Since 18 “Hg manifold pressure will hold level flight at 100 knots with the gear down, increase power smoothly to that setting until the ASI shows approximately 105 knots. 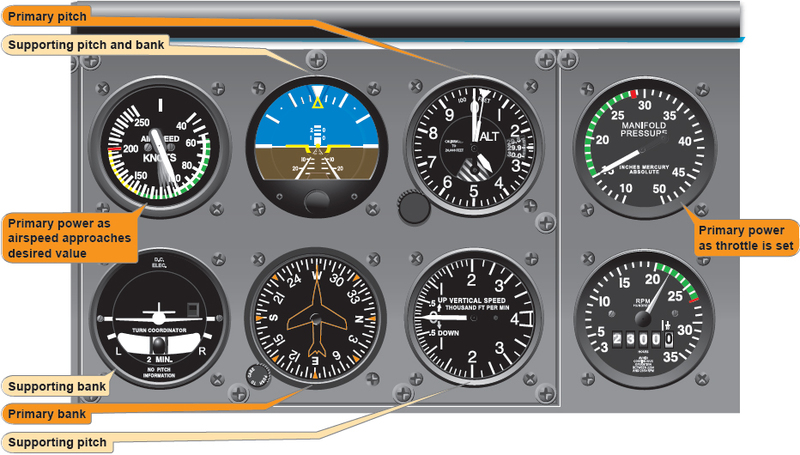 The attitude indicator now shows approximately two-and-a-half bar width nosehigh in straight-and-level flight. Proficiency in straight-and-level flight is attained when a pilot can consistently maintain constant altitude and heading with smooth pitch, bank, power, and trim control during the pronounced changes in aircraft attitude. Proper trim technique is essential for smooth and precise aircraft control during all phases of flight. By relieving all control pressures, it is much easier to hold a given attitude constant and devote more attention to other flight deck duties. An aircraft is trimmed by applying control pressures to establish a desired attitude, then adjusting the trim so the aircraft maintains that attitude when the flight controls are released. Trim the aircraft for coordinated flight by centering the ball of the turn-and-slip indicator, by using rudder trim in the direction the ball is displaced from the center. Differential power control on multiengine aircraft is an additional factor affecting coordinated flight. Use balanced power or thrust, when possible, to aid in maintaining coordinated flight. Changes in attitude, power, or configuration requires a trim adjustment in most cases. Using trim alone to establish a change in aircraft attitude invariably leads to erratic aircraft control. Smooth and precise attitude changes are best attained by a combination of control pressures and trim adjustments. Therefore, when used correctly, trim adjustment is an aid to smooth aircraft control.